A pictorial record of the Western Bulldogs’ history-making season 2016. The story of the 2016 AFL season is one for the ages, with the Western Bulldogs breaking a premiership drought that stretched 62 years. Players, coaches and fans alike have endured countless broken dreams since the Dogs last triumphed in 1954, as they have fallen agonisingly short of an elusive flag many times over. In 2016, as the club formerly known as Footscray garnered unprecedented support and goodwill from across the nation, the long wait for a premiership finally ended. But the remarkable aspect of the Western Bulldogs’ 2016 season is that a flag rarely seemed possible at any stage along the way, with injury after injury presenting seemingly insurmountable hurdles to the Dogs’ aim for another grab of football’s silverware. 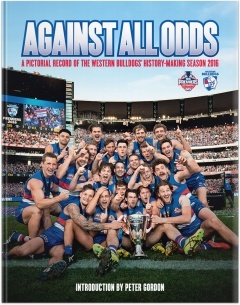 AGAINST ALL ODDS tells the story, through photographs selected from official AFL Media, and from the Bulldogs’ collection, of the Bulldogs’ ‘impossible’ season, from the hard slog of pre-season training on sweltering summer days, to the moment coach Luke Beveridge and captains Easton Wood and Bob Murphy lifted the premiership cup at last on Grand Final day. Chronicling a tale of heartache, hope and ultimately unbridled joy, AGAINST ALL ODDS captures the defining moments of the Bulldogs’ 2016 season — including a finals campaign that saw them as underdogs in every final against more experienced teams week after week, from coast to coast, as they overcame each and every setback to achieve a goal that many, if not most, thought impossible.